Aaron Hurst is a globally recognised entrepreneur and futurist. 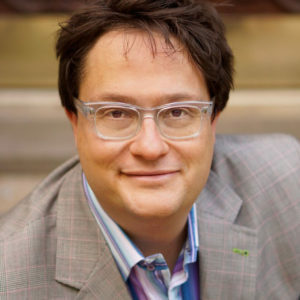 He is author of The Purpose Economy, CEO of Imperative, and Founder of the Taproot Foundation. He is a thought-leader and practitioner with his compass set to social impact. He has a depth of thinking on what purpose is and how we leverage it to build a thriving social purpose economy that will change how you think. In this conversation he shares tips, tools and examples about how to take purpose to the next level as leaders, fundraisers, managers, visionaries and just individuals who want to create a better world for ourselves and others. Whatever you do, don’t miss this podcast! You’ll be talking and thinking about it for weeks. If you enjoy this podcast from Leadership Space give us a 5 star review in iTunes, it helps others to find it! Sproutcast – to avoid duplicated comments from ours pick it up from 12mins 20seconds. Elise Sernik: Welcome to the podcast series: Conversations that shape us by Leadership Space. I’m Elise Sernik and I’m the Director and Founder of Leadership Space. This episode, I have the great joy and pleasure to sit down with Aaron Hurst. Aaron is a futurist and a successful social and commercial entrepreneur. I was able to sit down with Aaron because he came to Australia as a keynote speaker for the 2015 Better Boards Conference to come speak on the topic of the purpose economy, and he coined that term and has a book of the same name. He also ran a breakout session on his insights and work around pro bono services and more on that later. Sitting down with Aaron was quite a synchronous experience. My colleague and I – Melissa McPherson from People For Purpose –had presented on Aaron’s work last year and related that to the importance of applying some of these concepts and taking them forward with boards. So, it was really wonderful to have Aaron come, speak in person to the conference and then to sit down with him and have this conversation. Having heard Aaron and read his work a number of times, what I wanted from Aaron was to see if we could take as given people’s familiarity with the key concepts that he puts forward so that we could really explore more deeply and get full value out of his time. So what I really wanted to know was how his thinking related, particularly to the opportunities and the challenges of the social purpose sector, and he kindly agreed. This conversation is the result. The downside of course to this is to really get the most out of this podcast, it would be worth spending just five minutes watching his YouTube video introducing the notion of the purpose economy if you haven’t come across it before. And for even more value, either as a pre or a post to the podcast, you could watch his 58 minute talk – he’s done one to Google and one to LinkedIn – both of them recorded and on YouTube and I’ll be providing links to all of those on our website. Aaron set up a for-benefit corporation called Imperative and it provides a tool to assess your own purpose profile. It’s an instrument that his company developed and it’s free to take the test and then there are further tools and resources on his website, particularly examples of where people, leaders and cities are applying this purpose concept so people can understand it more deeply. So without further ado, let’s now go to the purpose conversation with the very kind and engaging Aaron Hurst. So Aaron, welcome to Conversations that shape us. Aaron Hurst: Excited to be here, looking forward to it. Elise Sernik: I really want to have an exploration today around you: who you are; how you got here; and what you see the relevance of the purpose economy concept and experience to the social purpose sector, the change sector, whatever you want to call it. And then to leadership and what this stuff means for people who are trying to lead organisations, lead movements and be entrepreneurial in the social purpose space. Elise Sernik: So, can I start with how did you get here, to this place in your life? What did that look like? Aaron Hurst: Yeah, it’s hard to know where to begin! You know, I think there are different aspects as I think about where I am now and different journeys that led to different parts of it. I think social entrepreneurship is very much part of my family. My grandfather worked for President Kennedy; developed the original blueprint for the Peace Corps; and was the CEO of the Aspen Institute which is a think-tank in Washington DC. So I’ve always had that truism model growing up. But for me, I think I’ve always been wired as entrepreneur first and foremost; I just loved trying to build new things and I love it when people say something’s not possible. There’s no greater motivation to me than hearing someone say: “something’s not possible”. Since I was a teenager, I’ve been starting businesses, different clubs, different enterprises, trying to sort of explore how different organisations work, how do you build things, how do you do things. I did a great programme when I was at university developing a curriculum for students to actually go out and teach in prisons and then come back and reflect on it as an experiential learning, service-learning model – and was really passionate about that. I then went and worked in education in the inner city of Chicago and really started to see how non-profits and social enterprise organisations work. What struck me in Chicago was that these organisations had a tremendous vision but they pretty much had given up on the rhetoric of actually ever achieving it because there was a poverty mentality in the organisation itself. I realised at 21 I can’t spend my whole career having these great inspiring visions and then slowly let go of that being a possibility, and at the time in the mid 90s, where I saw organisations setting crazy goals and actually achieving them, was in Silicon Valley. I moved to Silicon Valley in the mid 90s and worked for two socially orientated companies. I learned a tremendous amount about running a business, about scaling a business. They both had ten employees and both scaled to 100 over two years. It confirmed one thing: money matters, you can’t be naive about that but I also saw how much functional talent played a role in how these start-ups were hiring senior marketing people, technology people, HR people way ahead of when you normally would because they wanted to grow into it. I reflected on my non-profit experience and it was the opposite – it was five years after uni that you might hire someone. As a result, that was constantly tripping up organisations, not just in terms of execution but as places to work, they weren’t fundamentally able to be cutting edge. We’d prevented some of the best people from wanting to work there. I sort of had the ‘aha moment’, realising maybe there’s an opportunity to supplement philanthropy with a skilled philanthropy – a way for professionals to donate their marketing, tech, HR skills to help non-profits build this capacity. I started an organisation called the Taproot Foundation, which was all about connecting organisations to non-profits but doing it in a way that was high quality. It took us about three years to actually figure out how to get projects to get done. It was so hard. Elise Sernik: Absolutely and I remember looking into how to launch skilled volunteering in Australia six years ago and the issue wasn’t interest from the market, the issue was concern and resistance from the social purpose part of the economy. You had the same experience? Aaron Hurst: Yeah, so we had to really build the science of completion. How do you get these projects done so that non-profits can basically feel that they’d guaranteed a result and once we’d done that, we it really built out the market because it suddenly made pro bono a viable model for folks. So we did that and ultimately, what I talked about at the keynote, what I found was: the business professionals that were doing this were getting so much out of it. But it pointed to the fact that they actually weren’t getting enough out of their day jobs. They were treating pro bono as a supplement to an unhealthy meal and so much of our work had basically become unhealthy meals. Supplements are a wonderful business to be in but I felt the challenge that really needed to be addressed was: how do we make these meals healthier; how do we make our core jobs higher in meaning? And that really led me to leave Taproot and start Imperative to figure out how do we help transform the nature of work to make it as fulfilling as pro bono work. So that’s really the journey I’m on now. The book, The Purpose Economy, came out of that reflection but also just seeing so much change going on and trying to make sense of it and trying to take all these disparate actors who are all working in the same thing. This is part of a bigger historical context, and when we understand that it’s an economic imperative to do this: it’s not a nice to have; it’s not just about social good. But actually it’s the first time we have a marriage of social good and economic imperative at the same time, which is an amazing time to be alive and to be working. Elise Sernik: What fascinates me and interests me about your history and the way that’s played out is: it sounds like you’ve got the economic imperative and the social imperative going through the breast milk at the same time and that’s something that we still have a culture of people moving across like they’re different. Do you think that’s really kind of influenced the way you operate? Aaron Hurst: Absolutely, I think when you blur and work across sectors and work across lines you realise how much commonality there is, whereas on the other side, you tend to see difference. Elise Sernik: Yeah and you’re not shipping it across in chunks but actually it’s co-evolving together. Aaron Hurst: Yeah, absolutely. And you start to appreciate how hard each piece is. I think that’s the other component: really building an empathy for all the different players versus a sympathy and I think that makes a big difference. Elise Sernik: Yeah, very interesting. That observation around how powerful it was to see organisations start with a social purpose and become economically successful because they invested in their people and the quality. Aaron Hurst: Yeah, you see that over and over again. It’s amazing because you see all this about non-profit organisations and how they should operate, and I’m not sure how much they perpetuate here in Australia but I’m sure they’re similar, but we expect non-profits to operate on a fraction of the overheads of a corporation. If a non-profit has higher overheads than that, then it’s considered to be wasteful. But at the same time companies demand that so I think we have to change a lot of this if we’re really going to break through. Elise Sernik: As you think about that now and really looking at the way the social purpose sector looks in the US (probably your best reference, but anything you know about Australia). What role do you see the social purpose sector having in being part of creating and thriving (and I know you’re a futurist and an optimist) a healthy, more sustainable, economy and human existence, what role does social purpose sector play in that in your view? Elise Sernik: To mop up in some way? Is that? Aaron Hurst: Yeah, I mean absolutely. If you step into that role as a sector, there’s tremendous opportunity to lead; and talent to lead; and how our cities are formed to lead; and how we think about every aspect of the economy. But it takes having that optimism and to realise that opportunity is there right now. I think the other side is also entirely possible, which is: continue to do it the way we have been as a sector and what we’ll see is corporations filling that gap and leading and companies will actually become the purpose organisations because they’re focused on it and they’re seeing that gap that frankly non-profits aren’t filling right now. So I sort of see it as: there’s this gap in the market, non-profits can either stay where they are and move into it, or they can just stay doing what they’re doing and see companies and others fill that gap. I think that would be a shame because I think social sector organisations can do a better job and should be in that leadership role. Elise Sernik: What are they leveraging to succeed in that? What do you think are the diamonds that the sector has to bring and to contribute to that leadership role? What are the strengths that they’re bringing? Aaron Hurst: You know, it’s funny, you do corporate consulting and working with leaders. The number one thing I see companies struggling for is authenticity, a lack of authenticity, and I think that’s the thing where social sector organisations have that diamond. Not all of them but that ability to be authentic and to be real and being able to translate that into other aspects of the economy and society. It sounds so basic and when you’re sitting there you’re like: “of course” but that’s a tremendous advantage – just to be authentic. It’s really hard to manufacture authenticity. Elise Sernik: Completely resonates. The piece that I heard you talk about earlier around that notion that for social purpose organisations, in lots of ways, it’s presumed that people are there because they’re there for a calling and that somehow that we’ve got people who are more orientated towards or expecting to live a life with a calling and we’re not somehow leveraging that for all it’s worth. Do you think there’s truth in that for the sector? Aaron Hurst: Yes in both. You’ve got to recognise it’s hard for board members to see the day-to-day of what it’s like to be an employee. And to understand no matter how great the cause of the organisation is, we have fights with our workers, we have days that are just bad days, we have troubles with computers that don’t work, we do work that doesn’t actually end up getting implemented. These things happen and they’re often not connected to the core cause of the organisation, they’re part of how the whole mechanism works. And purpose in the sense of fulfillment and work: it doesn’t usually come in the form of the meta-purpose of the organisation, it comes from those day to day things. The things we remember about our work aren’t the accomplishments that happen every five to tem years, it’s those little relationship moments, it’s the little things we do that build the little moments that really matter. I think it’s building a culture where that’s what dominates the culture, instead of focusing on the meta-purpose. Because the meta-purpose is incredibly inspiring but it’s not part of the day to day of what you do. If you’re the CEO, all you’re doing is telling the meta-purpose story to investors; you live in that meta-purpose. That’s only true of like a handful of people in an organisation and you’ve got to be able to build that ability to relate to what it’s like to be an accountant, or to be on the front line of an organisation and realising it’s the little moments you’ve got to curate. Elise Sernik: So that notion you talk about: there’s the relationships; the work that matters; and growth. Can you talk more about what the opportunities and challenges are in your view for the social purpose sector that they need to get their head around in order to be able to mine latent purpose opportunity that’s sitting in their organisations, and in their people so that they can be positioned for success? Aaron Hurst: Yeah, I’m going to give you a slightly long answer to this because I think it’s three-stage process. And it starts with yourself, right. So if you’re not doing it with yourself then it’s going to be hard to do that for the people you’re leading. So, I really encourage people to stop and reflect on: what is the quality of relationships in your work today? Scale that from 1 to 10, like 10 being: ‘I have amazing relationships, I couldn’t handle another relationship’ and 1 being: ‘I’m really void of relationships that matter in my work right now’. And again, on impact: to what degree do you feel like your work today matters? 1 being: ‘if I had just died, no-one would notice’ and 10 is: ‘I couldn’t possibly make a greater impact.’ And same thing on growth, you know, to what degree do you feel like you’re growing? 10 being: ‘I couldn’t imagine growing more’ and 1 is: ‘I’m actually atrophying’. And if you just regularly do that process of inventorying those and seeing where you are and taking responsibility for that, you start to also see some of the small things you can do to improve relationships, small things you can do to feel more impact. In fact, most of the sort of changes in impact has more to do with observing the impact you’re already making because so much of the impact we have we are oblivious to; we don’t follow it all the way to the finish line. So we don’t ever see why our work matters. And then growth: realising that growth isn’t always given to you, you have to create it for yourself. Once you start to build that practice and it’s very simple, it’s five minutes. Elise Sernik: So for you, those are the three core components that make up purpose in a living, daily way? Aaron Hurst: It’s not for me, it’s for the science and to me that’s the science of it so those are the three things that if you have strong scores in those, that’s’ success. Success isn’t climbing the ladder; success is being able to score a 9 or 10 consistently in the qualities of relationship, impact and growth. And it doesn’t matter if you’re a barista at Starbucks or the CEO of Starbucks, being able to have that and being able to manage that, that is the pinnacle of success. Helping people define it that way: they’ll live longer, healthier; contribute more across the board having those three things. Elise Sernik: Be more successful. Elise Sernik: What’s interesting about what you’re saying there and resonates strongly in my own experience, and I love the point you made in the key note earlier that I’d love to come back to, but that there isn’t a direct correlation between how much money you need in your L&D budget. Aaron Hurst: No, not at all. It has to do with personal responsibility for that. There are certain cultures that make it harder; there are certain situations. The first step is just taking responsibility: self-awareness and taking responsibility. Elise Sernik: And understanding what it is you’re striving towards, where your value is. Aaron Hurst: So that to me is like the first step to your question. I think the second step is then: for your team, how do you help create those regular conversations so when you’re checking in with a team mate, you’re asking them: how are the relationships in your work now? Do you feel you’re making an impact? What makes you feel you’re making an impact? What growth do you feel now? What could make you do more of that? Helping them basically do what we call ‘job tailoring’ of getting their job to actually fit them. And it’s not a one-time thing; it’s just a regular part of that process and being able to talk to your people about that in a very authentic way. Then you start to see the organisation internally building a culture around purpose. The third stage is then taking that out to your constituents, whether those are customers, clients, whoever it is that you’re ultimately serving and asking them the same questions. So how are you basically improving the lives of the people you serve by strengthening their relationships, enabling them to make a greater impact and growing. And even as a non-profit you’re serving someone who’s down on their luck in so many different ways, just flipping those conversations to the positive, let’s focus on the relationships… Just because you’re in a position that you need to be served, one of the most powerful ways to address that is actually to put yourself in a position to serve yourself and getting out of that circle of being dependent on others. And then growth, even in the hardest times, we need to grown and often that’s when we grow best is when we’re struggling. Elise Sernik: Yeah, so much of what you describe feels like the science of what we’re doing intuitively. It’s really, really interesting. Aaron Hurst: Absolutely! Well, we all know these things – it’s human nature. I think the challenge is coming out of the industrial economy is we start trying to figure out how to create a manufacturing model for human being interaction. And that’s basically been, in some ways a wildly successful experiment and in some ways, a horrible one. Elise Sernik: In my sense, it’s kind of superficially successful. Your description of the professional who measures success by how high up the hierarchy you’ve gone and yet a lot of what our work is about is collecting these lost souls who were like at some point: what would I really like to do with my life? What really matters? The point you make about having to do it yourself, I think is really interesting. So, moving into the leadership piece, is what you’re saying effectively: you can’t lead an organisation that is fired up and leveraging purpose to the maximum unless you as a leader understand your own purpose, is that what you’re saying? Aaron Hurst: Yeah, I think it’s the best way to do it. It’s the most authentic way to do it. It’s the most successful way. I think you could probably fake it for a while but ultimately, I think that’s what builds strong leadership. It’s the vulnerability that comes out of that and stating that you have needs that you’re a human as well. A lot of what people do psychologically is that they project superhero powers onto others and then they constantly disappoint them because no-one’s really a superhero; they can’t create magic. And I think the more people can see leaders as human and as one of them, the better off everybody is because it gets rid of that magical thinking. Elise Sernik: Yeah, absolutely. So thinking about organisational change, which is effectively what we are talking about, and you’re very rooted in economic sustainability, how do you see these things playing in with each other: quality service and economic sustainability and cultural strength? How do view that ecosystem? Aaron Hurst: The first piece to me, which took me a while at Taproot to get my head around, was that we need to let go of the fact that we need our organisation to sustain. I think that’s a false framework and I think that’s overstated. I think there’s definitely a need to make sure you’re meeting your obligations, you want to build with the future in mind. And that to me is the better way to state sustainability – build with the future in mind. What I see sustainability often become is the dominant mission of just survival and survival is a horrible place for anyone to live. Whatever it is, it’s like the top mission of the organisation is not to lay anybody off or not to be able to stop what they’re doing and it’s just an illusion. I looked at Fortune 500 companies in the US, right – the largest corporations – and their average lifespan was about 50 years from start to demise. These are the companies we think of as the bedrock of our society and yet they’re less resilient that human beings and yet we make all these discussions about sustainability or whatever, as if these organisations should last forever. And they just don’t and I think we have to let go of that and mourn the fact that when you start an organisation, mourn its death from the get-go and therefore you’re able to let it take risks and to do things that matter. When I realised Taproot probably won’t outlive me, it actually enabled me to be much more successful in realising that. What I realised was: what I wanted to outlive me was the impact and then you start to have a real conversation about sustainability. Elise Sernik: So it’s that notion that’s been taken up, I’ve heard it certainly from the US and from conversations here, about knowing what your end game is and your end game is make an impact and get out. Is that what you’re saying? Aaron Hurst: It’s not necessarily ‘make an impact and get out’ but it’s make decision with impact first not the organisation first. I see so much competition that’s not necessary in the sector; I see so much preservation activity that’s not necessary. We talked about collective impact earlier: here’s the metric we want to change and we’re going to focus on that and if it turns out someone can do that better than us, we should have a moral responsibility to help them do that, not to figure out how to compete with them in that space. I think it’s a challenge when the organisation’s needs start to supplant the mission’s needs. As a leader really, it’s not hard to fall into that trap because you’ve got people around you, you care about; you want to make sure that they have a job; you start worrying about, from an ego standpoint, what failure is. That’s why I’ve always tried to frame success of the organisations I’m in, in external metrics not in our budget. Not in internal metrics. Elise Sernik: Yesterday, I was at the CEO’s day here and CEOs talk with some pride about feeling like their role is the custodian of the organisation. Aaron Hurst: Yeah, which is a very passive job. Which first is sort of a catalyst. Elise Sernik: Which is: I must leave the organisation alive. Aaron Hurst: Yes, absolutely. Good job! Yeah and you see this in the commercial sector, we don’t need organisations to survive. I think we should let go of that as being the goal and have much more measurement to impact, which sounds simple but I think it’s not the way the dominant psychology is. And boards are terrible at this because so much of the conversation of board rooms I’m in is about survival, it’s about competition, it’s about the oganisation and not about: this is our mission, what is the best way to do that? And the answer may be partnership in different ways. It may be things you wouldn’t look at if you’re looking first from the balance sheet. Elise Sernik: One of the comments you made which I thought was put so beautifully, something I have found myself saying having been a fundraiser in the past, is how do you tae the notion of purpose and you sort of talked about earlier, you know, that is sort of applies as much outside of the organisation it does inside. How do you see volunteers and funders and that notion of them finding their purpose and how that aligns to your relationship as an organisation? Aaron Hurst: You have to let go of the idea of economics being dirty thing and the idea of economics and the idea of market being a dirty thing and instead realising that’s just part of how we operate psychologically. And realise that volunteers and people, who are donors, get something in return and you have a responsibility, if you want repeat customers if you will, to give them something in return. I think we’ve done a poor job as a sector, of measuring that but ultimately it’s purpose is the payment for their volunteerism or their contribution and it’s tremendous value. Most of the time you write a cheque for a donation for a non-profit, you don’t really ever feel the impact of that. You don’t grow as a result and you don’t necessarily build new relationships as a result. So we think we’re giving someone purpose, but we’re not really. We’re just sending them a photograph or an annual report and for most people that doesn’t leave them feeling a sense of purpose. I think we need to do a better job as non-profits of thinking about how are we delivering purpose to our donors and to our volunteers and actually serving and talking to them about: did this improve relationships in your life? Did it make you feel a greater sense of impact? Did you grow from this? And constantly try to increase those numbers. Elise Sernik: And I thought that as it relates to the board is so critical because that notion that: “well you know my board is volunteers so I don’t want to stretch them too much and this shouldn’t impact their lives” and what you’re actually saying is no if you don’t give them that kind of big growth challenge opportunity, you’re not meeting their purpose need. Aaron Hurst: Yeah, we take a really patronising attitude towards volunteerism on boards and sort of baby them, we have to coddle them, we assume they don’t want to do hard work. What we saw at Taproot over and over again was if you set the bar high, the best people are inspired by that and step up and the other people step away. What most boards do instead of this, is keep the low-mid, mushy goal and a result no-one’s happy. You’re just better off setting a high bar and be willing to lose people. But knowing the best people, doesn’t matter if they’re paid or not paid, step up when they see a meaningful goal and want to hit that goal and it’s not about the money. I mean, we had countless millions of dollars donated in pro bono work with no cash payment and that was because they got goals they thought were worthwhile and that motivates people. Elise Sernik: Yes, and it worth more than money. Aaron Hurst: Yeah, absolutely. Which is why they’re willing to do it because they’re not getting it in other parts of their life. Elise Sernik: Have you got examples where you see that organisations, either in the for-benefit or the social purpose space, have got this concept and are running with it real time? Aaron Hurst: Yeah, I mean I think you see different ogansiations doing it in different ways – incredible diversity there. So you see some organisations in the pro bono sector really getting the fact that they have unlimited resources at their disposal if they figure out how to partner with companies and realise that they’re able to pay people, in a sense, through purpose, right. So you see a lot of organsiations, and in the US we looked at the highest performing non-profits and they tended to have 10-20% of their budget through pro bono time and that was a big part of what enabled them to break out of that poverty cycle. So there are countless examples in every city of the top performing non-profits that are doing that. So that’s one side, I think in terms of being able to really position themselves as a employer of choice, you see that again through a lot of these social entrepreneurial organisations, – I talked about Teach for America which has been the gold standard for a long time but there’s many more organisations along those lines that basically set the bar high and say: “we’re not going to be settling for anything less than the best”. They do that in their recruiting etc. and then people rise to the occasion so you see that in the US through organisations like that all the time. I think in marketing you see it a lot on the donor side, where organisations have realised that people are so hungry for purpose and they’re able to really turn that into a social and movement phenomenon. You see that in organsations like Room to Read, Paywater others that have been fundraising juggernauts because they’ve found a way to build that relationship piece into the process. And through that have been able to really have unbelievable results in terms of fundraising. Elise Sernik: I know that’s a bit like your joke about coming into paint the room. For some organisations to try and figure out how they give volunteers and donors some sense of connection and relationships without, as you say, taking them on a tour of the poor. What does that look like because that’s tough for some organsiations where only trained people can do this work? How do you see people breaking out of that insular approach to solving social problems that leaves them isolated from funding, from the wider community? Aaron Hurst: Sure. So on our site, you’ve got an assessment that helps you determine what generates purpose for you. And what we’ve found is fundraising is you need to be able to connect people to what purpose they want. One of the key ways that we differentiate is: people that see purpose as helping individuals; those who see it as more of an organizational level; and then some people who see it as a societal level. So I think part of it is really getting to know your donors and to really help understand do they need to see or hear stories to be able to connect with, how did that kid benefit directly, right. For others, that’s not that interesting, they want to know – show me how your org has become more sustainable and more effective and had a greater impact as part of that donation and give them exposure to that. And we all know storytelling is the best, you don’t have to take people in to the field with storytelling. And for some of them it’s society, they want to feel and understand how what they did contributed to broader changes happening in their community and society and you can show them kid after kid and that won’t do much for them, or show them how the organisation is doing well and they’re like I don’t really care. They want to know they’re actually moving the needle in society. Elise Sernik: So a much more nuanced understanding of what motivates your different donors. Aaron Hurst: Yeah, so if you think about big companies, right, like Coca-Cola, they segment their market and they do marketing to those segments. I think what we tend to do in philanthropy, and especially because most organisations are small, we tend to have one blunt instrument we try to use with everyone instead of realising: you’ve got these three different mindset about what needs to generate purpose. And maybe you as an organisation, say our strength is really at the individual level and then try to find ways to attracted those kind of donors but be much smarter about what those people psychologically are going to find meaningful. Elise Sernik: Thank you. Very, very much appreciate your time. Aaron Hurst: Absolutely! Fantastic – keep leading with purpose. Elise Sernik: We will! Thank you.